I spent a good four hours cleaning my house today. Phew, it sure needed it. We’re talking deep cleaning – scrubbing kitchen cabinets, beneath the oven knobs, etc. Serious biznass. I don’t know what it is, but I feel calmer and more relaxed when my house is clean. 🙂 And now, it is rather pristine. Grilling is basically mandatory on Labor Day, so that is exactly what we did. 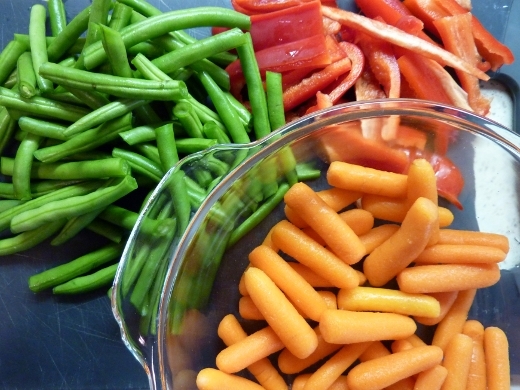 This meal was all about balance, and these veggies represent the lighter half of our dinner fare. 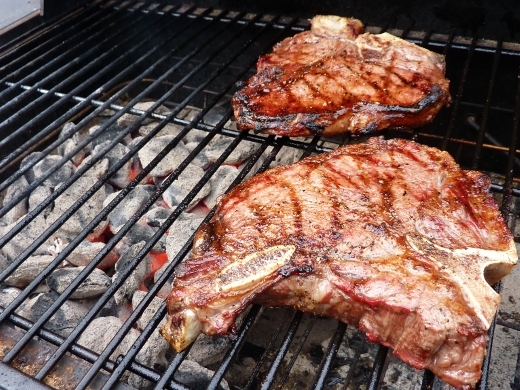 While I was inside preparing the veggies to be roasted, Tom was outside grilling these T-bone and porterhouse steaks. The grill master seasoned them with salt, pepper, and garlic powder. 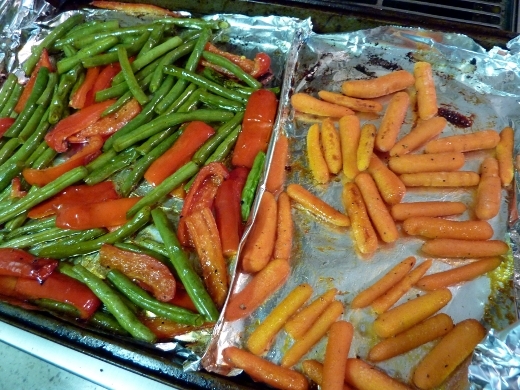 All that I did was toss the veggies with each of their respective set of seasonings, threw them on a baking sheet lined with cooking spray-covered aluminum foil, and popped ’em in a 425 F oven for about 20-25 minutes. So simple! This picture was taken about 10 minutes into the cooking cycle, when I briefly removed them from the oven and gave them a stir. And here is our balanced meal! 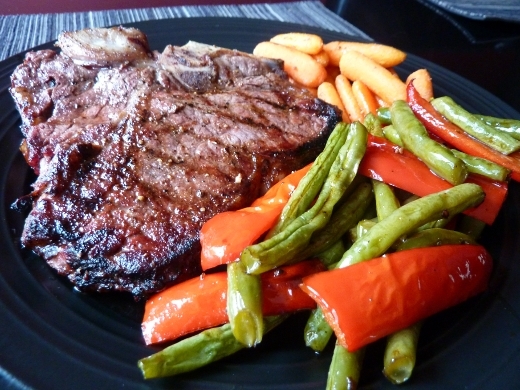 A generous portion of steak with two veggie sides. Super delicious! ♪♫ Currently listening to: Jenny Was A Friend of Mine – The Killers. Pingback: Pistachio-Crusted Chicken and Garam Masala-seasoned Roasted Sweet Potatoes « Meg.Goes.Nom.Nom.